clamp on current meter from Transtronics, this sites sponsor. By definition, No. 36 AWG is 0.0050 inches in diameter, and No. 0000 is 0.4600 inches in diameter. The ratio of these diameters is 92, and there are 40 gauge sizes from No. 36 to No. 0000, or 39 steps. Using this common ratio, wire gauge sizes vary geometrically according to the following formulas. Sizes with multiple zeros are successively larger than No. 0 and can be denoted using "number of zeros/0", for example 4/0 for 0000. For an m/0 AWG wire, use n = −(m−1) = 1−m in the above formulas. For instance, for No. 0000 or 4/0, use n = −3. We realize that the use of the legacy inch unit is not optimal - included here due to the historical nature of the wire gage (which should also be discontinued). De-rate with +0.00393 per °C - wire carrying current capacity sitting in the insulation and conduit will not be at 20 °C You will want to derate to at least the temperature rating of your insulation. Resistance listed here are not trade maxima - most wire that is soft or annealed will be slightly higher. 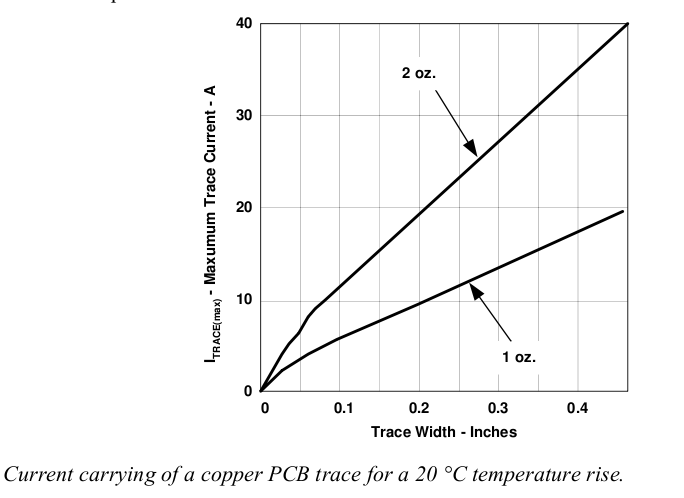 Resistance of hard-drawn copper is slightly greater - 2 - 3%. Stranded wire may also be higher. First, avoid the most common error in house wiring - hanging a 120Vac outlet off of a 3 conductor (L1,L2,N) 220Vac cable. It is dangerous! To do something like that you need a 4 conductor cable - (L1,L2,N,G) to provide a safety ground that is _NOT_ carrying any current. The table below will not support any reduced ground cables and is for _Copper_wire_only_!. If you run aluminum wire you need to consult the manufacturer's data sheets and be sure to understand terminal block treatments! This table also in no way compensates for length of run! This table is not for wires packed in conduit - wires need to dissipate heat! will have a specific building code! for 60 degree wiring (inside romex). This chart can diverge from what you see for many reasons. H. W. Preece’s Investigation way back in 1884 provided a way to calculate the fusing current of a wire based on its diameter. First, an example using the formula in the above section to determine the wattage dissipated in a 1 meter length of 12 gage copper wire at 10A. Note, in practical terrestrial cases, convective and conductive heat losses will dominate radiative losses. The following are appropriate for only two situations. One, where you have to install cabling in regions with exceptionally thin atmospheres, such as in vacuum vessels or piping. The other, is where the current densities are sufficiently high for the wire to glow - radiative transfer may then dominate the other loss mechanisms and the following can be used. Now, to figure the temperature rise per watt in steady-state conditions. Emissivity is always a fuzzy number that depends on details like surface finish and for copper can vary from 0.7 to .88 but for electrical work 0.4 works most of the time. Give it large error bands! Why was 'hot' Black in House Wiring? Black used to be the colour of the live wire in ordinary cables in Europe (as it still as it is in the USA). This is because the very first power wires were insulated by strips of linen soaked with guttappercha ( a good organic insulator) and natural rubber filled with soot. Hence: black colour for the dangerous one. The neutral wires weren't insulated at all, just bare copper wire. Later they got a grey coating (less soot in them), still later blue as artificial dyes came up in Europe. green/yellow protective earth (PE) connected to ground. L1, L2, L3 were labeled formerly as R, S, T respectively. Motor inputs were U, S, V. The corresponding cold ends of the motor windings were called X, Y, Z, usually shorted together in a "star" or "Y" connection arrangement. In older three phase cables the grey lead was also black so when installing cables, it was difficult to determine the direction of rotation. In cables older than, say, 60 years the PE lead was red, in Switzerland even more recently. Blue may be (and is frequently) used for any purpose, especially for switched power, can't be sure that it's neutral. Other colours may be used for any purpose. Green/yellow may not be used for anything else but PE. In the UK and those areas adopting British standards, red was universally live and black was neutral (with green earth if sleeved)for both fixed wiring and flexes from before the war, until 1971. Then the green with yellow stripe earth was introduced. (mitigating risks of mistake with red green colour blindness) At the same time brown was introduced for live and blue for neutral in new flexes. (3 phase went from red-white-blue to red-yellow-blue, but very few were seriously affected by this. There was also agreement that the colours in this order represent the sequence of positive half cycles for correct rotation. This was a more useful change.) In the UK from late 2005 fixed-wiring also changed to to brown & blue ( this change is sometimes referred to as euro-harmonization). At the same time 3-phase colours went from red/blue/yellow with a black neutral to brown/black/grey with a blue neutral. So now both blue and black can either be live or neutral depending on the age of the installation, leading to some potentially expensive and dangerous errors when old and new systems co-exist. Prior to Unification in 1989, much of East Germany had many appliances of the older German colour code, with gray and white or black as current carrying colours and red earth. Live and neutral polarity is not preserved in the Shcucko socket system, and it is important to be very careful with older equipment from this era of unknown provenance. Similar to basic tinning, but a much thicker coating of tin. It is commonly used with high frequency induction heaters because it can bond on stripped areas while the rest of the cable remains flexible. Bare (untinned) copper stranded wire is twisted first then gets an overall coating of pure tin. Its advantages are similar to prefused or pre-bond tinning(below). It is accepted by the UL and the CSA, but not the Mil-Spec standards. Tinned-Over-Coat or Top Coat that is then fused - which makes it stiffer. They use Heavy tin coated individual wires stranded which are then bonded by resistance heat. (the entire conductor is bonded before other operations, such as insulating, are started.) Acts similar to a solid conductor, but is less likely to break or work-harden in flex applications. Note - some insulated wire manufacturers also use the term "Prebond" to mean any stranded wire which has been fused or overtinned. Prefused or pre-bond conductors are usually accepted under UL and CSA guidelines, but not by Mil-W-16878 cable specifications. Top Coat, Tinned Over Coat, and Prebonded are often used for wire that goes through a hole in a PCB or terminal block to prevent stray stands from causing shorts. These terms are often misused.